I was a guest on the Thinking Poker Podcast, a fantastic podcast which I highly recommend. On this episode, I joined Andrew and Nate to chat about my poker life, discuss the most interesting pieces from this blog, and help delve into some game theory and strategy analysis. Check it out here: Thinking Poker Podcast, Episode 45: Mike Stein of Quantitative Poker. Check it out here: Poker Still Needs the Skill Game Argument. 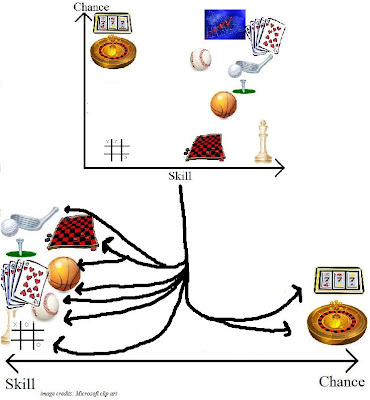 Check it out here: Post-Move Randomness in Poker: A Lesson from Game Design. A longstanding quirk of the US tax code relating to how non-professionals must report their poker income has persisted despite the explosion in poker's popularity over the past decade. This tax rule creates effective surtaxes on amateur poker play that vary wildly with a player's personal circumstances and very frequently exceed 100% of a player's actual earnings. It is long overdue, and more pressing now than ever as we stand on the verge of domestically-regulated internet poker, that our tax code catch up with modern poker by taxing its earnings in a reasonably consistent way. Amateur poker players currently cannot simply report their net poker winnings. Instead, they must report the sum of their winning poker sessions (gross poker winnings) as income, taking the sum of their losing poker sessions as itemized deductions. An amateur poker player's bottom-line income is correctly calculated as his or her net income for most tax considerations. However, there are several intermediate steps within the process of determining a taxpayer's income tax obligation that can trigger off of or otherwise treat as proxy for true income the taxpayer's Adjusted Gross Income (AGI), a figure which includes gross amateur poker winnings before losses are deducted. Consider an amateur poker player who, for simplicity, alternates between winning $100 and losing $100 in a weekly poker game for a year. Although he has made no money, his poker play contributes $2,600 to his AGI, as he reports $2,600 in Gambling Winnings and takes $2,600 in Gambling Losses. There is no meaningful theoretical or practical sense in which gross poker winnings represent actual income. Not only is our example a net loser at the end of the year, but he or she certainly has not had $2,600 of any sort of income. He or she never even possessed that much money at any point during the year! Having any aspect of the tax code consider this player to have $2,600 of some sort of income is akin to taxing corporate revenue as if it were its income, or to considering the holder of this stock to have had $1,000 in investment earnings over this year ($1,000 being the sum of returns only over days in which the stock increased in value). Of course, this is not how taxes work on these sources of income, but this is the problem that amateur poker players face. Depending on an amateur poker player's level of play, choice of game, and frequency of beginning and ending sessions, his or her AGI can very easily exceed his or her true income by tens or even hundreds of thousands of dollars, with no upper limit to the potential AGI inflation for higher-stakes amateur players. What are the impacts of an artificially-inflated AGI? Taxpayers who reside or play in one of about a dozen "bad poker tax states" owe state income tax on their gross wins, with no state deduction permitted for gambling losses. A taxpayer who would otherwise take the standard deduction will either be unable to take gambling losses as an itemized deduction, or will lose out on the difference between his or her "real" deductions and the standard deduction. That taxpayer's spouse also loses his or her standard deduction, even if filing separately. The deductibility of medical expenses is limited by AGI, which includes winning poker sessions before losing poker sessions are deducted. Roth IRA contributions cannot be made by taxpayers whose AGI exceeds $127,000. Traditional IRAs have similar limits in cases where the taxpayer is covered by an employer pension plan. The Free Application for Federal Student Aid uses AGI instead of net income in determining the financial capability of a family to pay for a child's college education. Most non-poker itemized deductions are phased out at certain AGI thresholds. A 3.8% surtax is applied on the investment income of "high-income" taxpayers, again determined by AGI. The first two of these have a broad reach and can have a significant impact for many amateur poker players. About 30% of the US population resides in the "bad poker tax states", and the majority of poker players within any game environment are net losers who will be getting hit with an effective tax on their losing if they take the standard deduction or fit into any of these other circumstances. My conservative estimate is that at least a million Americans currently owe a tax on their poker activity which exceeds their actual winnings. They're not currently paying these taxes, of course. That the status quo has gone untouched for so long is almost certainly due to the low tax compliance rate on poker income, whether it be due to conscious tax evasion of unreported income or to a lack of awareness that a losing year of poker would have any tax implications at all. All nine inequities would be instantly and completely alleviated if amateur poker players could simply report their net annual poker winnings instead of reporting gross winnings and deducting gross losses. This can be achieved by defining the length of a poker session to be an entire year of play. The definition of a poker session is currently lacking modern guidelines from the IRS anyway and will already require explicit or implicit clarification when the first domestically-licensed sites start reporting player results, so let's do it right. Why is this a sensible solution? To define a session as an entire year of play is actually quite appropriate for poker. Even many amateur poker players are, by the very nature of the game, quite businesslike in planning their financial risk, managing a segregated poker bankroll and focusing on long-term expectations for their play. Reporting net instead of gross income for amateur poker players would also have the benefit of being consistent with what almost every reasonable American would expect and perhaps how many amateur poker players incorrectly report their poker income currently. There'd be no need to file any poker activity during a losing year, and, while contemporaneous records should still be required, the players who inevitably fail to keep proper session-by-session accounting would nonetheless have a reasonable chance of estimating their total win or loss at the end of a year. Why should you care about fixing this problem? IRS & Legislators: Fair public policy should never tax an activity at more than 100% of the income it generates. Even if you believe that there should be some sort of extra "sin tax" to discourage activities that may be resemble or enable gambling, the more appropriate way to address that should be a stable, flat fee that players could easily plan and account for. Regulators: Proper consumer protection involves being transparent about the costs of using a service. Regulated online poker should absolutely involve compulsory reporting of winnings to the IRS, but to have that in place before repairing this issue is to set a trap that millions of Americans would unknowingly fall into and is an abdication of regulatory responsibilities. Operators: Communicating the current state of amateur poker tax reporting to your online players would turn many customers (rightly) away, yet failure to do so will likely lead to a dramatic drop-off in your player base. A delayed-impact, often-unanticipated and occasionally-large annual fee for losing is not good for customer retention. This will have to be fixed eventually for your customer base to subsist and grow, so out of respect for your customers, please expend resources towards fixing it now. This simple and sensible change will eliminate an undue and capricious tax burden on millions of present and future American amateur poker players. To fail to correct this prior to the spread of domestically-regulated internet poker is to ensure an inefficient outcome for all parties involved. Frankly, this rationale applies to traditional gambling activities as well. However, the need for change is most crucial for poker, a competitive strategy game which naturally lends itself towards narrow edges over regularly-occurring play, compels conscious maintenance and management of a bankroll, and attracts intelligent, price-sensitive competitors. I don't know exactly how the poker community goes about changing this part of the tax code. I suspect that players cannot do it alone. We need our industry to stay aware of this problem and to represent our mutual interests. Keep the dialogue going. I have updated the Cash Game Tax Planning Calculator for the new year, containing some brand-new potential negative tax effects which will impact certain amateur poker players. If you haven't used the Cash Game Tax Planning Calculator before and you're a US poker player, especially if you're only playing part-time and don't file your taxes as a professional, now is the perfect time to start. The purpose of this spreadsheet is to calculate a player's after-tax expected value based on their intended poker play for the year. This is important to do in advance, as a few different negative tax effects can easily turn a winning player into a losing player. You'll also probably want to check out the older posts on the Cash Game Tax Planning Calculator, as I'll only discuss the 2013 changes here. The recent fiscal cliff compromise included a few ways to penalize high-income tax payers... but, as with many pieces of the tax code which attempt to assess income, these income thresholds look at Adjusted Gross Income rather than net income. AGI is a before-deductions figure which includes "phantom income" for amateur poker players resulting from the sum of all losing sessions they play throughout the year. Amateurs report the sum of their winning sessions as income and deduct the sum of their losing sessions (to the extent of their winnings) later as an itemized deduction. Phaseout of itemized deductions for "high-income taxpayers"
The first new rule triggers for taxpayers whose AGI exceeds $250k for single taxpayers, $275k for heads of household, and $300k for those who are married and filing jointly. Once this threshold is exceeded, most itemized deductions are reduced ("phased out") by 3% of the amount of the excess of AGI to the threshold, up to a maximum phaseout of 80% of these deductions. Luckily, the deductions which are phased out do not include the gambling loss deduction, which would have resulted in a very costly direct surtax on gross amateur poker earnings, but essentially all other common types of itemized deductions are included. Further discussion and links can be found in this thread. This will create a negative tax effect on those amateur poker players whose phantom poker income pushes them over the $250k threshold. Professional players (who have no phantom income) and all other Americans should be mindful of this new threshold as well, but they get the privilege of having their AGI reasonably approximate their true income. Naturally, the biggest impact here will be on those with many non-poker itemized deductions. Phaseout of personal exemption for "high-income taxpayers"
Similarly, using the same thresholds as the above effect, a taxpayer's personal exemptions are reduced by 2% for every $2,500 of AGI in excess of the threshold. This, again, impacts all amateur poker players with high gross winnings, and will hit the hardest on those with dependents who would take multiple personal exemptions. Personal exemptions were not considered at all in the 2012 build of this spreadsheet, but are accounted for in the new version to allow for this effect to be captured. 3.8% surtax on investment income for "high-income taxpayers"
The final noteworthy change is a 3.8% surtax to fund Obamacare, applied to the excess of AGI over a certain threshold, but not exceeding the amount of one's investment income. For this rule, the threshold is $200k for single taxpayers, $250k for those who are married and filing jointly, and $125k for those who are married and filing separately. Poker winnings, be they amateur or professional, are not considered investment income, so this effect will only matter on players who happen to have significant income from traditional investments, but it hits very hard for those who do. Other changes in this version include an update of the default tax brackets for 2013 and a bug fix regarding the way deductions were treated in some cases where itemized deductions and amateur gambling losses were less than the standard deduction. To account for these new tax considerations, there are 4 new inputs in the 2013 version, all of which are located in the Tax Rates tab at the bottom of the sheet. All other inputs are the same as the previous version, and everything else about the sheet, its backend, and its runtime should essentially be familiar. Personal Exemption — The total amount of your personal exemptions. For 2013, this is $3,800 for a single person with no dependents. If you have dependents such that you take more than one exemption, this should be changed to $3,800 times the number of total exemptions you take. Portion of salary which is investment income — The approximate amount of investment income you expect to have this year. Note that your Annual Salary figure on the main tab should also include this amount in its total, as the Annual Salary figure is intended to include all non-poker sources of income. This new field simply requests the portion of that total non-poker income which comes from investments so that the effect of the new investment surtax can be computed. Phaseout Threshold — The threshold for the phaseout of itemized deductions and personal exemptions as described above. Set this equal to $250k if you are single, $275k for head of household, and $300k for married filing jointly. Investment Tax Phaseout Threshold — The threshold for the phaseout of itemized deductions and personal exemptions as described above. $200k for single taxpayers, $250k for those who are married and filing jointly, and $125k for those who are married and filing separately. Each of these new effects will only unduly impact amateur players, due to the AGI inflation from their phantom poker winnings; high-income professional players will be paying higher taxes as well, but only when their legitimate winnings exceed the income thresholds. With that in mind, we first look at the case of an amateur player with high phantom poker winnings and thus significant overinflation of AGI. Consider a high-volume amateur poker player, perhaps a full-time student playing poker on the side as his primary source of income. He has $80k net worth, non-poker income of $3k per year, all of which is from investments, and $3k in non-poker itemized deductions (state taxes paid last year, perhaps). Let's say that he plays in certain poker games such that he has an hourly rate of $40 and a standard deviation of $1,800 per hour, and that he typically plays for 2 hours per session. I'm envisioning a solid winner at multitabling small/mid stakes online here, which is not currently relevant to very many American taxpayers, but I've chosen a higher-variance and higher-volume profile to highlight the potential impact of the new rules. This player will certainly put in enough volume to avoid the classic negative tax effects of the risk of a losing year or the risk of being unable to deduct losses due to not hitting the standard deduction, so we don't worry about that in the graph. However, once his number of sessions increases to about 250 for the year, his expected AGI from the sum of his winning sessions starts to hit the threshold and the effects of the investment surtax and exemption/deduction phaseout start to cut into his profits, leveling off at a maximum effective loss of $2,500 when these are all fully phased out. The new tax rules won't turn this high-volume amateur from a winning player into a losing player, but they will take a rather high percentage of his average after-tax profit at certain volume levels. Some low-volume amateur players will already be at or above the income thresholds from their non-poker income, in which case even a single poker session will produce phantom income that will cut directly into the new tax rules. These players are in much worse shape than those in the first case. Consider a upper-middle-class person with a successful career outside of poker who enjoys occasionally playing poker for fun, but still cares about winning, or at least not losing money in her poker career. Let's say she has $1M net worth, and non-poker income of $250k per year, $20k of which is from investments, and $15k in non-poker itemized deductions. For simplicity, let's say that her choice of game and her winrate profile is the same as that of the high-volume amateur, except that the wealthy amateur fits in far fewer of these 2-hour sessions each year. The impact on expected after-tax winnings is dramatic. In 2012, she would have had to play about 40 sessions per year to break even (due primarily to the classic negative tax effect of having a losing year). In 2013, she now must play three times as much volume to break even after-tax, and her earnings are increasingly divergent from what they would have been in 2012. The gap between the earnings lines would continue to grow until all investment earnings were met with the 3.8% surtax and all deductions and exemptions were phased out to their maximum. Any amateur poker player whose income is at, over, or near the thresholds for the new tax rules will have to be very careful. Depending on their winrate profile and the amount of investment income and deductions they expect to have, many will be forced out of the game. Many amateur poker players will not fall into either of the above two cases. However, if such a player happens to run well enough during the first portion of 2013, perhaps by spiking a big tournament score, such that the likelihood of hitting the thresholds goes on to become significant, they will suddenly find themselves impacted by these effects. The spreadsheet is designed to be used on an ongoing basis after every session is played, or at least after any big wins or losses. As another example, a large early realized loss will mitigate the negative tax effect of having losses which, along with other deductions don't exceed the itemized deduction, which will benefit the profitability of future sessions during the year. Running this calculator often will make sure you always know the costs of these new negative tax effects as well as the ones that have always been around. Everybody's situation will be different, particularly under these new rules, since they are sensitive to the particular amounts of investment income and non-poker itemized deductions you expect to have. If you're a responsible player, you should check out the calculator and to use it to compute the after-tax expectations for your individual situation. Here's hoping that you'll still be +EV after-tax, but if not, it's better to determine that now rather than putting in your year of play and getting hit with an excessive tax bill at the end. As usual, I am eager to hear your feedback, suggestions, questions, bug reports, etc. I'm also working on coding a version of the calculator in [R], mostly for my own edification as I learn the language and for my own use. It won't be as pretty or user-friendly, and I am not planning to ever be able to compile it into something palatable to the general public, but it will be faster and more flexible if you're comfortable with code. Feel free to email me if you want to mess around with it. This essay was originally published in twenty parts, one at a time over the course of the month of September, in one post per day. To view any specific thought as its own page, use this index, otherwise you can read the entire essay below. Part 4: What if an outcome-based approach specifies observing "average" players? Part 8: How are we measuring skill, anyway? Part 10: Games of skill vs. "involving skills"
Part 11: Why not blackjack or other casino games? Part 12: Why not sports betting and investing? Part 14: Does rate of showdown matter? Part 15: Does rake matter? Part 16: Does duplicate poker have higher skill relative to chance? Part 17: Why does poker need randomness? 3) Outcome-based approaches fail on populations of similarly-skilled players. 4) What if an outcome-based approach specifies observing "average" players? While we have seen that an outcome-based approach based on empirical data will vary depending on the player population being observed, a possible means of rectifying this is to fix as constant the levels of skill or experience that observed players should have. According to the recent study "Is Poker a Game of Skill or Chance? A Quasi-Experimental Study" by Meyer, Meduna, Brosowski, and Hayer (and, oh, don't worry, we will most certainly be getting to this study in more depth later), German law apparently does exactly this. A game is deemed to be gambling in Germany by a predominance test based on the "skills and experience of the average player" versus that of an expert, where the average player is "defined as an individual who is generally interested in playing the game, has learned the fundamental rules and has had some practice playing". David Sklansky also muses on this sort of approach here, noting that an outcome-based approach which compares the winrate of an expert against that of the comparable lossrate of an amateur (rather than against a baseline of zero) will yield faster convergence, i.e. fewer hours played before the expected value of winnings will exceed the standard deviation by any desired amount. Both of these approaches to defining the average player depend, quietly but importantly, upon self-selection. Somebody who is interested in playing poker or actively plays poker has chosen to do so, potentially because they are at least moderately skilled at it relative to some peer group. Depending on the marketing of poker or the overall popularity of the game, the skill level of such a player could vary tremendously both over time and over different geographical locations and markets. Some might argue that the "average" poker player would be an infrequent, casual player who rarely puts much thought into strategy, is drawn to the game for social or risk-seeking reasons, and plays fairly badly. I would generally disagree with this characterization, but if you looked at a median taken over every human who has ever played a hand of poker, perhaps it's close to this. For the sake of this consideration, let's assume this is true. What would it mean if a large presence of casual players like this were enough to nudge poker over the line into being predominantly chance under a given approach to predominance? This would mean that, if poker had been less popular or marketed in a less-appealing way to casino gamblers, then the remaining more serious players might have been able to enjoy a classification as a game of predominantly skill, if not for the horde of terrible players that the game happened to attract. What if this group of casual poker players were to all quit poker and take up another game with a significant chance element, such as backgammon? Would the predominance classification of every game jump back and forth alongside the whims of the casual-gaming masses? This highlights the more practical concern that the skill level of the average self-selected player in poker or in any game varies considerably over time. In the height of the first US poker boom, the average self-selected online player was incredibly weaker than the average online player is today. If poker were to become less popular with casual players, then only the strong, serious players would remain, and they will have become the new "average" player. As time goes on and the surviving poker players improve their skills, the $1/$2 NL cash game could cross over from predominantly skill to predominantly chance under any particular outcome-based approach to predominance, which brings along with it to all of the paradoxes and issues from part 3. A measure of predominance should be representative of the game itself, static and not varying its classifications over time. An alternative approach might be to define an average player as an adult of average intelligence without any prior experience playing the game. Run down the rules of the game, maybe even give them an hour of basic strategy advice, and see how they do against the experts, as at least one study has done. This is a more consistent approach, but even this will vary over time if the overall intelligence level of society increases. For example, in a parallel universe where humanity is much worse at strategic thinking and logic, tic-tac-toe might be too difficult of a game for the average person to master. Only the top intellects in this society, perhaps trained in the game since birth, could hope to become tic-tac-toe grandmasters. Maybe the human minds in this society are skewed towards being good at playing as "O", but fail to play properly as "X", so that the outcome of the game between most players is mostly determined by the coinflip to determine turn order. Is tic-tac-toe a game of predominantly chance in this parallel universe? If so, does it cease to be so if some profound event increases the strategic intelligence of everybody to our real-world level? Yes, this is highly hypothetical, and this effect should be fairly negligible in practice, but it is still theoretically troubling. The questions I have posed here are, to me, philosophical questions with no clear answer. There are reasonable arguments as to why a refined average-player approach, despite a dynamic dependence on humanity's intelligence, could have practical merit in a society which wishes to permit for-money strategic competition while prohibiting pure gambling. If so, however, these issues should be acknowledged... and it'll be interesting to see just how big of any future poker booms might be. 5) What if an outcome-based approach specifies observing deliberately bad players? David Sklansky has popularized an argument for poker being a game of skill based on the fact that a player can deliberately lose at poker, but cannot deliberately guarantee a loss at roulette, craps, slot machines, lotteries, etc. The argument does concisely draw a clear distinction between multiplayer strategy games like poker and noninteractive casino gambling, and for that it is valuable when dealing with the general public, but can this argument hold any robust role in a formal classification of games? This argument is very narrow and fragile, as it would no longer apply if the casino games added a "you lose" button as an option during play. The argument groups blackjack into the skilled category, perhaps intentionally, but the fact that one can hit until they bust at blackjack merely a particularity of the rules; a blackjack variant that prohibited hitting on 18+ would be a very similar game. One might also observe that some games, such as roulette and lotteries, do allow a guaranteed loss if a player places multiple bets to cover all numbers. Interestingly, this approach deems rock-paper-scissors to be a game of chance since no move will lead to a guaranteed loss. Overall, the argument blurs the line between symmetric multiplayer games and noncompetitive house games, which seems especially unnecessary given the limited scope of what is actually demonstrated. All that it shows is that the game has strategic inputs which can affect outcomes. I don't think this argument is good for much more than being an effective soundbite to an audience that will not be receptive to longer arguments. To attempt to tie this idea into a formal approach to predominance, one could imagine a study that measures the performance of novice or expert human (or computer) players relative to the performance of an algorithm designed to make extremely poor moves, as one such study, On a Relative Measure of Skill for Games with Chance Elements, has done in an effort to quantify the range of possible payout outcomes for poker and for casino games. For any type of poker, the outperformance should be sizable and converge quickly, especially in variants of poker such as NL where the deliberately bad player could bet most of its stack and then fold. Alternatively, rather than a worst-possible player, a randomly-moving player could be used, choosing equally among all possible moves at all times, as at least one real scientific study has done. Here, too, the humans win rather handily, leading to a conclusion that poker must be predominantly skill since the player decisions affect the outcome so dramatically in the extreme cases. These are effectively outcome-based approaches that specify measuring play between a competent player and an incompetent player. Theoretical consistency would lead this rule to make some strange classifications. We can build hybrid games that effectively have "you lose" buttons without doing so blatantly. For example, consider tic-tac-toe, a game of skill under this approach, and roulette, a game of chance. Then a new game, Tic-Crap-Toe, could be defined as first playing a round of tic-tac-toe and, if the instance of tic-tac-toe ends in a draw, move onward to craps to determine the winner of the overall game. So if a player wins in the tic-tac-toe, the overall game is over, and the chance-only game only happens when the tic-tac-toe game is drawn. Since tic-tac-toe can be deliberately lost, such an approach would classify the Tic-Crap-Toe amalgam to be a game of skill, no matter what the underlying Game Y is. In practice, of course, tic-tac-toe should almost always end in a draw, even among the population that would be attracted to Tic-Crap-Toe, so this is just a fancy way of embedding a game of chance into a shell of a simple strategy game. Even without resorting to pointless stitching together of games, really, this approach would end up classifying every symmetric multiplayer game that I can think of as predominantly skill, as almost all games do contain sufficiently-terrible strategies. A game having a clearly bad strategy doesn't say anything about the rest of its strategic lines or their complexity. The worst strategy path doesn't reveal anything about the rest of the strategic paths, so these approaches cannot accurately measure the depth of skill in a game. Under this approach, if a "you lose" button was attached onto any game, these measures would say that more skill has been added to the game, but the only skill that has been expanded is the skill of knowing that, hey, you probably just shouldn't ever push this button. That's some sort of skill, sure, but only in a very limited, impractical sense. The poor performance of a worst-possible player only shows that a nonzero amount of skill exists in a game, and that's the limit of this type of approach. All outcome-based approaches to predominance will conclude that a game is predominantly skill if the game is played for long enough. Whether the approach be a measurement of how often the superior player wins, of how many instances of a game must take place before the expert player will be ahead with probability x, or of what the interplay between the means and variance are for winrates in the game, our good friend the Central Limit Theorem will ensure that it's only a matter of timescale for any of them. Any game, when played as a best-of-N series for a large enough N, will result in the superior player winning with an arbitrarily-high probability. When a legal system attempts to classify the permissibility of games based on an outcome-based measure of predominance, this would mean that any game of predominantly chance but nonzero skill would become a game of predominantly skill if extended for long enough. One restructuring that would work on any two-player game with a single winner would be to legally mandate that the game be played as a best-of-N series for a large enough N. So a world in which a legal code uses an outcome-based approach to predominance and classifies some games with skill elements and finite variance as games of chance is a world where the law effectively mandates minimum session lengths of games. Would a rule like this ever be put into place? From a public policy standpoint, this is pretty plainly bizarre, instills artificial inefficiency, and is not in line with any presumed intent behind separating games based on predominance in the first place. This has been acknowledged at least once in the government response to pre-trial motions in the Black Friday proceedings. The answer to that question depends on, among things, whether one is talking about a single hand of poker or something else. It is a mathematical truism that in any game involving both chance and skill, the element of luck will tend to be evenly distributed the more times the game is played such that even in a game that is 1% skill and 99% chance, the player with the greater skill will prevail in the long run. See Three Kings Holdings LLC. v. Stephen Six, 45 Kan. App. 2d 1043 (2011) (affirming trial court’s holding that a “single hand” analysis applied under the predominance test). Additionally, the more evenly matched in skill particular players are, the more luck will predominate. To the best of my knowledge, nobody has ever actually explored the possibility of redefining and legally mandating games to have a forced minimum length, despite the fact that, in terms of theory and construction of games, it would be reasonable to do so. It turns out that the common way to resolve this paradox is to ignore the potential ability to redefine and legally mandate games to be played as best-of-N series and to instead focus the analysis to the smallest possible interval of play in any given game. Unfortunately for cash game poker, unique among all popular competitive strategy games, this time interval is both extremely short and not representative of real-world patterns of play: one single hand. This isn't necessarily impossible to overcome, as many courtroom arguments do indeed work along the timescale of skill predominating over a single hand, or, in the case of tournament poker, a single tournament. If convincing, intuitive enough arguments can be made with these restrictions, then that's certainly the best approach, but the impracticality of focusing on a short time interval that almost nobody chooses to play is unfortunate. Maybe legal mandates on minimum game length are not as preposterous as they seem. They might be most easily-imposed online, where a depositing player could be prevented from initiating a withdrawal until a certain number of hands or tournaments were played, similarly to bonus money with a play-through requirement. This sort of online model would let the player break up his required play over multiple sessions while preventing the possibility of realizing winnings before the necessary amount of play was put in, which would be difficult to control for in live poker. Very few players would end up being inconvenienced, if the requirements were reasonable. It would be interesting to see how a judge would respond to a business which employed this model, but, really, the point of highlighting this impractical consequence is to illustrate how counterproductive and nonsensical the very idea of predominance is, not to assent to it. A game is a game with constant characteristics regardless of who plays it and regardless of how long its players choose to play it. If, to echo a popular assessment of poker, a game were a "game of skill in the long run, but a game of chance in the short run", what exactly is it that's changing in the fundamental nature of the game between those two durations? Some believe that the fundamental differences between tournament poker and cash game poker are enough to put them into separate classification under predominance. To be sure, on a practical level, the structure of tournaments does go a long way towards solving the issue of cash game poker being measured on the scale of a single hand. Even though tournaments involve at least a slightly different skill set and have their own considerations which can influence chance in the outcomes, when facing an outcome-based measure of predominance, the relative influence of skill over chance should be greater over one tournament than it is over one hand. Alfred Denning wrote an amusing hyperbolic take on the issue of predominance which mused on the potential legal advantages that a poker site would have if it had only offered tournaments. There is an important practical role for this distinction to play, especially since playing poker in a tournament structure almost exactly matches the structure of typical tournament play for other competitive strategy games with random components, all of which are almost universally perceived as being predominantly skill. Drawing comparisons between our game and these other games is a valuable means of conveying some understanding of the issues to laypeople. However, at least on a purely theoretical level where we might consider bizarrely-structured tournaments, I don't think there's anything universally true about tournament poker in general that separates it from cash game poker in general when it comes to the influence of skill and chance. Last year, I wrote "A logical approach to the skill vs. chance structure of cash games vs. tournaments", which is worth a read or reread and fits in well with this series. In summary, there's nothing inherent to tournament poker relative to cash game poker that shifts the paradigm or order of magnitude of skill and chance in the game. By way of contradiction, if it were the case that all tournaments were predominantly skill and all cash games were predominantly chance, this is generally inconsistent with the structural similarities between a single-table, winner-take-all tournament and a cash game, as I detail in that post. Certainly, it would be easy to design a tournament structure with small starting stacks or hilariously-large antes to make the outcomes of the tournament arbitrarily close to those of pure chance, and one could design a cash game structure with deep stacks and perhaps some sort of minimum number of hands to play that would have an arbitrarily large amount of skill. For the common approaches to predominance, there are no easy generalizations when it comes to poker. In practice though, yes, the tournaments that people commonly play do indeed lock in a minimum amount of play before awarding prizes, so this can be important when facing an outcome-based approach to predominance, as it was in Sweden (as discussed in my linked post above). But rather than this meaning that tournaments might be predominantly skill while cash games are not, I see this as more of a logical stepping stone in asserting that both forms of poker are predominantly skill. Demonstrate that tournament poker is a game of a similar structure to tournaments in any other game, and then use something like my old argument to demonstrate how the changes that make a tournament into a cash game generally serve to allow superior players to avoid being eliminated by one unlucky hand, to allow players to compete for shorter spans of time instead of locking them in for hours or days, and to prevent forcing players into taking effective financial risks for many times their initial investment. Start with the clear comparison to the games which are universally accepted, then work through the theory to show how other forms of poker are similar. 8) How are we measuring skill, anyway? At the beginning of this series, I temporarily assumed away that there was a reasonable and consistent means of individually measuring either the amount of skill in a game or the amount of chance in a game, but this is far from obvious. Let's forget about chance for a moment and consider only how to measure the amount of skill in a game. Certainly, in some cases, we can add or subtract game elements to existing games that would clearly increase or decrease the amount of skill in the game, e.g. poker with deep stacks could easily be said to have more skill than very short-stacked poker, or poker where nobody was allowed to look at the river card would likely have less skill than normal poker. Directly comparing two different real-world games, however, is difficult and has no clearly-motivated approach. Does chess have more or less skill than 200bb PLO? Does bridge have more or less skill than a heads-up sit-and-go? Can there possibly be a way to quantify this? Perhaps not. I would say that there's no way of constructing a well-ordering of skill-ness on the space of all games, that is, it might not be possible to compare every pair of games under a skill metric. When games have disparate skills along completely different dimensions, there might be no objective way to say which game is tougher. To put it another way, if we're using the standard inequality symbols to denote ranking the amount of skill between games, it could be the case that neither "poker <= bridge" nor "bridge <= poker" is true. We'll be able to order some games against each other ("50bb poker >= 20bb poker"), but not all of them. Rather than a well-ordering, the best we can hope for is a partial ordering. The same is true for measuring chance. There are explicit ways to add a strictly positive amount of chance into a game, like increasing the probability of reversal in rando chess, and ways to remove chance, such as splitting pots where players are all-in before the river in a poker cash game according to pot equity. But if disparate types of randomness are changed at the same time, the result could have no clear basis for comparison. If a poker variant were to roll a die after the river action and deal a 6th card whenever the die came up 1, but the stacks were made deeper, this game would not compare directly with regular poker. Not only is there not necessarily a well-ordering on either skill or chance, but even a well-ordering isn't enough for what the predominance test presumes. There can be well-orderings that don't induce measures or quantifications. For example, one can order the set of all foods according to which foods one prefers the taste of so that one always have a preferred food among every pair of possible foods, but this doesn't endow us with a way of measuring how much we prefer one food over another. It doesn't make mathematical sense to say that pizza tastes twice as good as hamburgers (what would the units be? 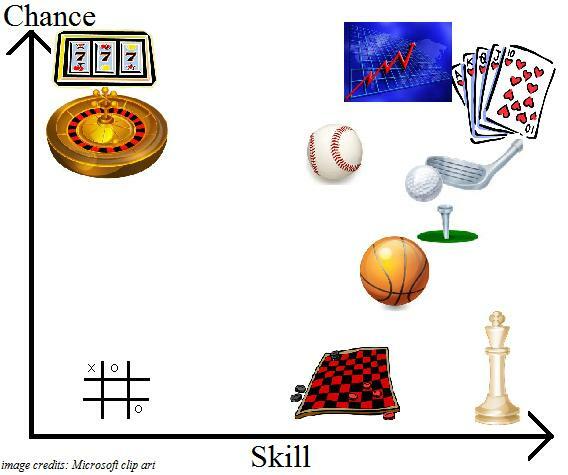 ), and measuring skill in games is similar. If, as is often informally presumed, there were indeed individual metrics on each of skill and chance, then, as we've seen, there would still be no clear unique way to combine them onto a single scale for predominance, but we'd be a lot closer to having consistent ways of doing so. If we didn't quite have that, but instead we had a well-ordering on each of skill and chance, then we'd immediately get at least a partial ordering on the predominance scale. Recalling the two-dimensional chart from before (and remembering that the placement of games is illustrative and nonscientific), pick a game. Let's consider baseball. We'd be able to say that any game located both up and to the left of that game (the red region below) has a higher relative influence of chance over skill than the game under consideration, because the game has higher chance and lower skill. Similarly, any game located both down and to the right of that game (the green region below) has a higher relative influence of skill over chance than the game under consideration. This is easy to visualize on the chart and, mathematically, this means that any function which maps skill and chance into their relative influence must be componentwise monotone in its two inputs. However, if one game has both more skill and more chance than another, then they cannot be compared, hence, all that we get is a partial ordering on the relative influence of skill and chance. This wouldn't end up revealing much about poker's ranking in predominance, as it is a game that, from any perspective, surely lies near the top-right corner of this chart. If we were able to well-order each of the skill and chance axes, then we'd automatically get a partial (but incomplete) ordering on the relative influence of skill and chance. Instead, we have neither, only a partial ordering on each of skill and chance. So, we've got a set of objects where we care about generating a single quantitative ordering for them, where the two characteristics which are to generate this ordering are independent of each other and neither has even a well-ordering. This is, at best, an incomplete problem. Functions that map skill and chance to a number based on some approach to their relative influence can still exist, as discussed in the first thought in this series, but the fact that predominance presupposes inferring a quantitative measure on components which can't be quantitatively ordered themselves serves to highlight the lack of clear logical foundation to the question. In the last thought, we've seen that there's not a good basis for developing formal, quantitative measures of comparison of skill and chance between games. Slipping away from the abstract and back into the real world, however, there are plenty of ways to draw practical comparisons between poker and games considered not to be games of chance. After all, the most important characteristic of poker is that it's a symmetric, closed multiplayer game, which makes it completely distinct from every other activity widely perceived as gambling. Tournament poker (or a fixed-duration cash game) is like every other competitive game or sport; players exercise some skill, some chance elements out of their control can affect the outcome, but the superior player will win more often. Aside from a historical association with casinos and gambling, what differences between poker and other games are shaping its social and legal treatment? Does poker have aspects which are similar to those of other games? ... comparison of high skilled and low skilled players entered in each tournament in the WSOP finds that the high skilled player wins 54.9 percent of the match ups. For purposes of comparison, we calculated the regular season win rates for professional sports teams that made the playoffs in the previous season – making the playoffs last year is akin to being a highly skilled player entering the WSOP. Since the year 2007, teams that made the playoffs the previous season win 55.7 percent of their games in Major League Baseball against teams that failed to make the playoffs in the previous year. Thus, in some crude sense, the predictability of outcomes for pairs of players in a poker tournament is similar to that between teams in Major League Baseball. To the extent that baseball would unquestionably be judged a game of skill, the same conclusion might reasonably be applied to poker in light of the data. You know what the most ironic part of all of this is? The sample size you get playing poker actually works against us. Imagine poker was played like boxing matches, and we played maybe 5 short sessions per year. There would be players who would be undefeated for years - perhaps even decades. And poker would be widely appreciated as exclusively a game of skill as shown by Joe "Ace" Tyson's 17 year undefeated streak as Poker World Champion. So what makes the uncertainty in games like baseball and other athletics seem different than that of poker? It is likely primarily due to the fact that poker's randomness is overt and intrinsic, whereas the random elements in sports are non-overt and external. That's worth a lot when it comes to public perception, and it's potentially worth noting in an intellectual discussion, too. In an idealized world, where the physics of weather loses some chaos and yields to the pure rules of a physical sport, one might be able to say that there's no chance in that sport other than strategic uncertainty and the imperfections of human execution. The rules of sports don't demand the external random element, and perhaps would prefer being played in a world without wind. Poker, on the other hand, depends on the randomness its shuffle introduces in a way that could not so easily be fully removed from the game in an idealized world (though I will explore this more later). The conclusion we can draw from this is that, psychologically, most people find salient randomness only in elements of overt/intrinsic randomness, despite the fact that we've seen that non-overt randomness can contribute just as much or more towards uncertainty in game outcomes (rock-paper-scissors). The amount of salient randomness in a game is often used as an intuitive proxy for the degree of chance in a game. This bodes poorly for poker, as it doesn't get much more salient than a game historically framed as a type of gambling where river suckouts blatantly change winners reasonably often. There's not much we can necessarily do about this... though focusing our marketing and television coverage of the game a bit further away from showing only "exciting" preflop races might help. Coincidentally, intrinsic random elements in games such as poker are a much tamer type of randomness than that of games which are affected by chaotic external forces. Players can always have perfect knowledge of the exact probabilities of every possible intrinsic random component of poker, whereas measuring the effect of weather on sports can only be estimated. Similarly, if we were to stretch our definition of "game" a bit to be able to compare poker to investing, then poker would once again be of a tamer type of randomness than that of market forces. Poker's variances are all finite, bounded, and precisely calculable, whereas much of the world of investing involves potentially-unbounded or fat-tailed randomness. Readers of Taleb's The Black Swan will appreciate this. Changing our focus to a different class of games, one much closer to poker, we can consider popular mind sports. Since their fundamental structure is so similar, why do games such as Scrabble, bridge, Magic: the Gathering, and other competitive card or video games rarely get considered to be games of primarily chance or gambling? It's not at all clear that any of these games necessarily involves less chance than poker. The key difference between poker and these other mental games is that poker seems to be a simpler game on the surface. Not only are the rules to poker quite easy to learn, but most Americans have grown up with enough of a loose exposure to the game (or to the often-conflated video poker) to know the hand rankings, to know that bluffing is a thing, but to otherwise think that the game is mostly about "betting on" who will get better cards. If poker takes "a minute to learn, a lifetime to master", the latter part is lost on the common person taking a cursory examination of the game. Meanwhile, Scrabble clearly demands a vast vocabulary, bridge's strategic complexity seems well-ingrained in our culture, and Magic: the Gathering has a huge rulebook and is often downright intimidating in its complexity for new players. In fact, when the first competitive Magic: the Gathering tour with cash prizes was being launched, the game's lawyers prepared a variety of arguments to present to a court in order to obtain a judgment that Magic is a game of predominantly skill, almost identically to the situation we find poker in. The difference was that, when the lawyers showed up in court to present their arguments, the judge told them not to bother — he had tried to read through and understand the entire rulebook last night, unsuccessfully, and was therefore completely convinced that the game must be primarily skill! Depending on the variants, Magic generally has similar amounts of both skill and chance as poker does. The fact that one game is much easier to learn than another doesn't actually correlate to the depth of skill or influence of chance in a game. From this, we learn that salient complexity plays a key role in shaping people's impressions of how difficult a game is. The amount of salient complexity in a game is often used as an intuitive proxy for the degree of skill in a game. Poker may not be able to completely eliminate river suckouts to bring down its salient randomness, but the other side seems like a front we could improve our arguments upon. Make poker's hidden complexity into salient complexity. Make efforts to highlight the strategic complexity of poker in appropriate settings such as courtrooms. Showing that skilled players win more money than unskilled players with K9o is fine, but it doesn't appeal particularly to the common person's sense of salient complexity. What about showing the court an in-depth hand breakdown, perhaps from a training video or recorded strategy interview with an expert player? I would imagine that, after the first 2 minutes of a poker pro analyzing a single decision within a hand, employing dynamic multi-level strategic interplay and spouting complicated-sounding (but legitimately relevant) numbers to do so, the average person would abandon any misconceptions about poker's simplicity. 10) Games of skill vs. "involving skills"
Poker is a game of skill. Poker involves skills to play. While both are true, the two phrases have different meanings. Various legal standards of predominance sometimes demand that the lines are blurred between the two, but I believe that the former is the stronger statement and the one that should be treated as the social and legal standard for classifying games in an ideal society. Similarly, other card games commonly considered gambling, such as blackjack, demand talents similar to those employed in poker, requiring skilled players to take advantage of known odds. numbers, knowledge of human psychology, and powers of observation and deception. So, what's wrong with this? Well, every game of skill (predominant or not) will involve skills to play. However, the list of skills might not be very long, and it should not be implied that the degree of skill present in a game is directly related to the number of personal talents necessary to succeed at the game. Weinstein's list for poker is pretty typical, and even that short list is problematic in that listing powers of observation and deception (or physical tells in general) might lead a layperson to conclude that online poker might not be a game of skill because it doesn't involve that particular skill. The other skills one could list for poker would all fall under the general umbrella of logical deduction and strategic thinking. In pure strategy games such as chess, checkers, and go, strategic thinking might realistically be the only talent or ability one could list as being helpful for the game. Every symmetric, closed, competitive strategy game will, of course, involve strategic thinking, and I would argue that a reasonably consistent definition of "game of skill" need consider no other skills involved. Strategic interplay between players is the essence of skilled competition, and the undue focus on other talents and abilities that creating a list of "involved skills" necessitates is a diversion from the fundamental strategic structure of a game. 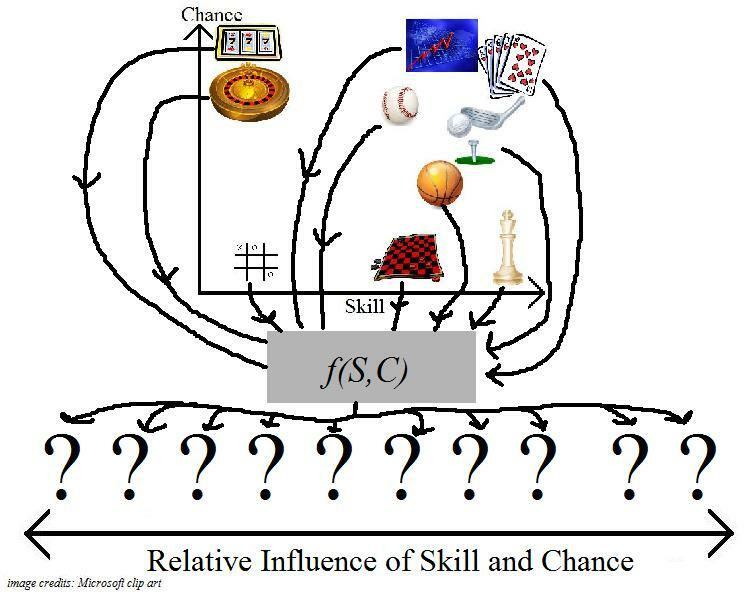 The real issue reason that this seemingly-semantic matter is worth probing into is that many games of chance also "involve skills", despite having no strategic game-theoretic structure. As noted by the government, blackjack and other variable-negative-EV house certainly involve some degree of "facility with numbers" and computing odds. Market-based non-game activities, such as sports betting or stock investing, most certainly involve plenty of skills as well, and most certainly have long-term winners and losers, but that does not make these pursuits into symmetric, closed, competitive strategy games. Any theoretical asymmetric, noncompetitive house game could be modified so as to involve as much computational thinking as necessary, or any other sort of desired external talent. We could create roulette variants where your probability of winning is decreased even further beyond the default odds unless you can accurately track and perform calculations with some external numbers (Rain Man Roulette), or perhaps unless you can perform a feat of strength (Festivus Roulette), or unless you can answer some trivia questions about the Beatles (Roulette It Be). Appending outlets for various skills to a game of chance doesn't change that the structure of the underlying game, and none of these makes roulette into a bona fide game in the sense of game theory (orthogame). Essentially, specific skills such as facility with numbers, estimating odds, and powers of observation will be involved in a wide variety of activities in life. Some of those activities might be games of pure chance, some might be games of chance where the degree of the negative expectation depends on player decisions, and some might not be games at all. But only symmetric, closed, competitive strategy games will involve the particular skill of strategic thinking, and this is the only involved skill which necessarily reveals anything about the fundamental structure of the game. Blurring the line between skills involved and the fundamental presence of strategic interplay in a game can lead to comparisons of categorically dissimilar games and endeavors. In the realm of poker advocacy, many well-intentioned players argue that poker should be treated differently than gambling because poker "involves more skill than other forms of gambling". Part of Weinstein's decision cites a case involving a video poker (not poker) variant called Joker Poker, and Weinstein distinguishes poker and Joker Poker by noting that "Joker Poker involves significantly less skill than the live Texas Hold'em games operated by the defendant". Lines of reasoning such as this, tripping themselves up between the involvement of skill in an activity and the structure of each activity, might sometimes be perceived as implying that poker is, say, essentially a "more advanced" version of casino gambling, rather than something fundamentally different. At the very least, I think we as a community can pay more attention to the fact that these two phrases carry different meanings, even if we sometimes have to focus on "involving skill" for certain legal standards. 11) Why not blackjack or other casino games? We've generally restricted our focus so far to symmetric, closed, competitive strategy games (orthogames). Traditional casino gambling almost exclusively consists of one-player "games" played against the house, structurally dissimilar from poker and from all other traditional games of skill. To me, the presence of strategic interaction is the essence of skill when it comes to non-physical games, which is why I feel that the categorical divide between one-player and multiplayer games should be central to the approach of classifying games. However, there are some subtleties to the dividing line between house games and competitive games that are worth considering further before we assume them all away. In order to be profitable to the casinos, these games [video poker] must be based on chance. If skilled gamblers could win regularly, the casinos (or bar or restaurant owners) would begin to lose money, and the machines would soon be removed from the gambling floor. This is a sensible approach to the definitions of skill, chance, and predominance; any 1-player gamble played against the house that a for-profit corporate entity offers openly must be a game of chance, because, in theory, it wouldn't make sense for a game freely and openly offered by a business to be a game of skill, as adverse selection and a rational customer base would ensure that the profitable customers would bankrupt the company. Games of skill could only exist between two or more players competing in a symmetric game, where perhaps a company could take a fee for facilitating the game. This definition is clearly an easy fit for most -EV casino games, all of which are more or less identical to a series of simple bets on random events. If the player inputs in a game such as (most) video poker or craps only serve to change what type and degree of fixed-odds -EV bet is made, then the "game" is essentially a slot machine variant with a few different levers to pull. It is less obvious that this definition applies to blackjack and other games that can, under some conditions, be +EV for the player, but I believe that a careful analysis shows no meaningful theoretical distinctions between blackjack and strictly -EV house games. It is first worth acknowledging that blackjack exists as somewhat of a special case, an anomaly, a market inefficiency, a triumph or travesty (depending on your perspective) of human irrationality and behavioral tendencies. The casinos make enough profit off of suboptimal play in blackjack that they make the most money by continuing to offer the game and spending resources to identify and block people who play correctly. The fact that the average person knows that blackjack can be beaten presumably drives a lot of traffic to that game. But even blackjack being a potentially beatable game doesn't make it a game of skill. The expected value (EV) of the player in a house game is essentially just a cost of playing that the casino sets. Any casino game could have its odds or payoffs shifted so that it had zero EV for the player, with the casino instead charging some sort of external fee or rake, and the game itself, in terms of its mechanics and decisions, would be the same. Even if the casino chose to set the payoffs and fees so that the player had a positive EV on something like a slot machine, perhaps as a promotion, there is no sense in which the playing of the slot machine has had any skill or strategy injected into it. Identifying the profitability of the promotion would be a skill involved in being successful at making money at casino games, but this skill is external to the game itself and, for the reasons I've argued in the last thought, not of any particular bearing on the fundamental nature of the game. It is potentially worthy of note that, despite being stylized to resemble a game played against a human dealer, blackjack is still a one-player game. The house is not a player in the sense of game theory, since it has no ability to make decisions and instead follows a pre-specified strategy. The optimization problem posed to the player of blackjack is one of decision theory, not game theory. There are some potentially-interesting implications of this perspective. A symmetric, competitive two-player variant of blackjack could be created where players compete against each other instead of playing against the house. The players might alternate positions with each other and each follow the same set of rules (note that traditional blackjack is not actually symmetric since the dealer cannot split or double down), and this adaptation of blackjack would make it into a game in the same family as poker, though it may not have much of a depth of skill. Similarly, a symmetric, competitive, multiplayer game could be made into a one-player game played against a casino by offering electronic or dealer-operated instances of it in which the house played the role of one of the players with a fixed strategy, much like the heads-up limit holdem machines introduced onto casino floors in Vegas. The key distinction here is that a "player" adhering to a fixed strategy is not a player at all in the sense of game theory. When one knows with certainty that one's opponent will adhere to a certain strategy, there is no room for strategic interaction. Note that this is different than situations in simple games where each player would likely know the opponent's strategy or at least what the opponent should be doing, such as when two experts play a heads-up No Limit Holdem endgame with 5bb effective stacks. Each will almost certainly closely approximate the known Nash equilibrium of this subgame. However, whether it be as a mistake or as an attempt to exploit perceived weaknesses in his opponent, each player could change their strategy if they wanted to. The opportunity for strategic deviation does exist. In contrast, in something like blackjack, the house's decisions are fixed by definition of the rules of the game. Sure, a trivial game such as 5bb heads-up No Limit Holdem will not have much of a depth of skill, but its structure as a game where each party has strategic choices keeps it distinct from casino gambling, even though the outcomes will closely resemble coinflips as they will in any low-skill game. This highlights some issues with what many have adopted as a quick and easy approach to predominance. This common but imperfect approach classifies any game in which a player can sometimes have a positive EV as a game of skill and a game in which a player can only have a zero or negative EV as a game of chance. There's a good intuitive appeal here, but this would classify some clear pure-chance activities as games of skill under conditions, perhaps promotional, where the payouts or odds were shifted to favor the player, completely independently of the depth of skill or strategy within the activity. More troubling would be that a game such as poker could be classified as a game of chance if the rake were too high, an idea which will be treated further in a later part of this essay. Categorizing games purely on their EV under various conditions may be of practical financial importance to a player trying to earn a living by playing a game, but does not necessarily measure any structural presence of skill in the games. It's possible to be a professional gambler by making a living from exploiting profitable casino game opportunities, and doing this does involve skill, but this is not the same as being a professional player of poker or any other symmetric, competitive game. Logically, there one direction of the relationship between EV and the existence of skill in a game that holds up in some cases. If we assume that we're only looking at symmetric games, symmetry being key here, then the existence of a +EV player/strategy for any given game under some conditions indicates that there must be some component of skill in the game, i.e. that nontrivial strategies exist and impact the game outcome. However, the converse is not true; it is not the case that the lack of existence of +EV players/strategies imply that there is no skill in the game. A clear game of skill such as chess could fail to demonstrate +EV players if the rake taken on the game was too high or, alternatively, if the observed population was all of expert players of similar ability. The argument which focuses only on EV is essentially an outcome-based approach to predominance and thus has shortcomings in each of the ways we've explored already. There is no evidence in the record that Congress considered whether a game was housebanked was a relevant characteristic in determining whether it constituted gambling under the IGBA. Neither dictionary nor common law definitions of gambling distinguish between games based on that factor. Nor does any federal gambling statute other than the IGRA rely on whether a game is house-banked to define its scope. Certainly, we must keep in mind that both some legal systems and some of the general public will refuse to appreciate the relevance of the categorical distinction between multiplayer strategy games and simple gambling. So, if we are in a situation where we must consider both types of games together, we can't classify the relative influence of skill and chance in a game by EV alone, as that might be affected by the particular nature of an operator's chosen fee structure or the population of opponents under observation. 12) Why not sports betting and investing? One common approach to considering the nature of the role of chance in a game is to focus on the degree to which the players and their actions or decisions exhibit control over the outcome. Certainly, in a game with close to no intrinsic random elements such as chess, ignoring the coinflip to start the game, the actions of the players will be essentially the only factor which controls the outcome, whereas in games of pure chance such as roulette, the player clearly has no control at all over the outcome. When considering whether or not market-based activities such as sports betting or investing might be games of skill, this approach would focus on the fact that the player cannot influence the result of the bet, so it draws a distinction between betting on an external event and playing a game like poker, as we have in the previous thought. While appellee has demonstrated that some skill is involved in the playing of Electro-Sport, we believe that the element of chance predominates and the outcome is largely determined by chance. While skill, in the form of knowledge of probabilities, can improve a player’s chances of winning and can maximize the size of the winnings, chance ultimately determines the outcome because chance determines the cards dealt and the cards from which one can draw — in short, a large random element is always present. That the skill involved in Electro-Sport is not the same skill which can indeed determine the outcome in a game of poker between human players can be appreciated when it is realized that holding, folding, bluffing and raising have no role to play in Electro-Sport poker. Skill can improve the outcome in Electro-Sport; it cannot determine it. There is a danger in this sort of approach when it comes to poker with the distinction between "improving an outcome" and "determining an outcome". If the "outcome" in poker were considered to be which player wins a single hand, then this creates a focus on who wins at showdown rather than on how many chips are won or lost in each pot, which will be treated in more detail in a future thought. Still, I can think of no games of skill that don't involve the players having significant control over the outcome, though often the player will not have full control, as in poker. It's pretty good as a rule of thumb. Every strategy game where the strategies have a nontrivial impact are games where players have some degree of control over the outcome; players choose strategies, and strategies contribute to outcomes in games of skill. What I feel this approach does best is to cleanly separate strategy games from advantage gambling without strategic interaction (e.g. market-based activities, video poker such as this Electro-Sport), and it does so in an intuitive way. Without the strategic interaction of a multiplayer game, there is generally no means for a player to control the outcome in a one-player game. [W]hile all games have elements of chance, games which can be determined by superior skill are not games of chance. For example, bowling, chess, and billiards are games of skill because skill determines the outcome. The game itself is static and the only factor separating the players is their relative skill levels. In short, the instrumentality for victory is in each player’s hands and his fortunes will be determined by how skillfully he use (sic) that instrumentality. Poker, however, presents players with different hands, making the players unequal in the same game and subject to defeat at the turn of a card. Although skills such as knowledge of human psychology, bluffing, and the ability to analyze odds make it more likely for skilled players to defeat novices, novices may yet prevail with a simple run of luck. No amount of skill can change a deuce into an ace. Thus, the instrumentality for victory is not entirely in the player’s hand. In State v. Taylor, our Supreme Court noted this distinction. 111 N.C. 680, 16 S.E. 168 (1892). The premise here is shaky. While the possibility of players being presented with unequal challenges does necessarily imply the presence of chance in a game, it has no bearing on the depth of skill in a game. Really, this approach presupposes that a fair card game where each of the players have the same probabilities of getting dealt each possible hand is an "unequal challenge" as soon as the players are dealt different hands. Competitive games with intrinsic and overt random elements, such as poker, bridge, backgammon, and Scrabble, are still symmetric games as long as the probabilities are fair, even if players end up getting given different cards each time they play. The focus should be on the structural symmetry, rather than on the presence of random components. Overall, the presence of equal challenge doesn't seem to correlate very well with the influence of either skill or chance in a game. Rando chess, with any probability of reversal, does happen to present its players with an equal challenge, but can be modified to reach any desired point in the fallacious skill-chance continuum. More importantly, duplicate poker, as we'll discuss soon, is a poker variant that manages to present its players with more of an equal challenge but does not necessarily eliminate (or even reduce!) the role of chance in the game. All that this approach captures is that the game contains a nonzero element of chance, but, despite this fact being overlooked by the ruling, this is true even for almost-fully-deterministic games such as chess and billiards, where the random selection of the turn order does indeed present the players with an unequal challenge. Of these two approaches, both are fairly narrow. As the treatment of the many thoughts in this essay have shown, there is much more relevant detail and nuance to the relationship between skill and chance in games than can be captured by a single argument alone. That being said, as far as simple arguments go, the idea of control is a reasonably good measure of the presence of skill in a game, though it doesn't measure chance well. On the other hand, the idea of equal challenge must necessarily discriminate against games whose random components generate a variety of gameplay, despite this being a common component of many high-skill games. 14) Does it matter that bluffing lets you overcome the deal of the cards? A simple, popular outcome-based approach to predominance considers how often real-world hands of a particular poker variant end in a showdown. Intuitively, the argument here is that, when a hand ends in a showdown, the cards held by the players have "controlled" the outcome, and when a hand instead ends in all but one player folding, since the cards were never shown, the "cards didn't matter" and thus the players' decisions to fold are what "controlled" the outcome. This idea was most famously formalized in a 2009 study by security firm Cigital which computed showdown rates using a 100 million hand database of real Holdem hands, supplied by PokerStars. The study itself is a short read with a simple approach. It immediately discloses in its summary that it doesn't attempt to quantify the effect of chance, merely to provide "compelling statistics about the way that the outcomes of games are largely determined by players' decisions rather than chance", which is a terrific self-awareness. So how compelling are its arguments? The primary finding of the Cigital analysis is that, 75.7% of the time, in a real-world Holdem hand there's no showdown. A secondary finding is that, of the remaining 24.3% of hands that do go to showdown, only about half of them are won by the hand that, had no players have folded, would have gone on to be the best hand. Therefore the random deal of the cards only controls the outcome about 12% of the time. This echoes the ideas of the toy game "Luck Holdem", where players place bets on their hands prior to the deal and then run out the cards and see who wins, as described by Howard Lederer in a rather solid short essay on skill and chance in poker (written many years ago, when he was still a respected member of our community). The notion that skill is limited if you can't fold and unlimited if you can is hand-wavy nonsense that is superficially compelling only because it coincidentally aligns well with our intuitions about which games are more or less skillful out of the class of commonly played gambling games. There's no folding in bridge or gin but they are obviously highly skillful games. Heads up limit holdem with no folding allowed would be another. One can conceive of poker variants that allow folding but have essentially no room for skill (NLHE with face up hands for instance). Indeed, poker without folding is still a game which fits a broader definition of poker, as long as checking and betting are still allowed. Heads-Up Limit Holdem without folding, as Ike mentions, still has plenty of skill, though it is probably less skill than regular poker. To that extent, it's reasonable to say that adding the option of folding back into a poker game should generally serve to increase the depth of skill of the game — but introducing any new strategically-nontrivial move to a game would increase the strategic space of the game. The ability to fold is only one of various strategic options, not necessarily of any greater worth than any other. It is possible that there might someday be a type of poker game which doesn't allow folding but which nonetheless involves more skill than the forms of poker that we play today. Chance would probably be higher as well, but with enough strategic depth, the skill could be increased moreso than the chance was under any desired measure. An approach such as that of the Cigital study would not capture the role of skill in this type of poker game. Similarly, this sort of approach is also dependent on the underlying population and thus could change over time if player tendencies shift due to development of the game strategy. It doesn't seem likely for multiplayer NL or Limit Holdem, but it's theoretically possible that, someday, they might be played using strategies that led to more showdowns and that these strategies, unknown to us currently, turn out to be better strategies exhibiting a deeper probing into the skill of the game. More realistically, the Cigital study may have yielded different results if play-money or micro-stakes games were observed. Another study, published by sociologist Kyle Siler, explored the relationship between player strategies and payoffs using real hands of poker. The study contains some interesting observations on the relationship between social psychology and players' strategies at poker, but the most memorable "finding" of the study, thanks to the media attention this point received, was one relating to showdown rates. Siler found that players who won pots more often were more likely to be losing players, unsurprising to any experienced poker player but generally misinterpreted in the media. Naturally, overly-loose strategies will lead to winning more pots, but will lose money overall. Siler suggests the idea that inexperienced or poor players may conflate the ideas of winning pots and winning chips, causing them to skew their strategic decisions towards trying to win hands, which is an interesting behavioral hypothesis. While I don't think that Siler meant for this conclusion about losing players winning more pots to be taken as a statement on the role of skill and chance in poker, to do so properly would nonetheless illustrate that players' strategies control the outcome, whether one is considering the outcome as the winner of the hand or as the magnitude of the amounts won and lost by the players in the hand. A player can choose a loose strategy and will win more pots by doing so, which shows that a player's strategic choices exhibit control over how often they win hands. Similarly, if the player who chooses a loose strategy ends up losing more money by doing so, this shows that the player's strategic choices also exhibit control over how many chips they win — which is, of course, the object of poker, rather than trying to win every pot. The various mainstream treatments of Siler's study seemed to generally miss this distinction, instead drawing unwarranted and illogical conclusions like "in gambling, quit while you're ahead". Returning to the core idea of the Cigital study, there is some potential philosophical trouble with the role that the random components play in guiding player decisions. If we are to say that the players and their decisions have fully controlled the outcome within a hand that did not go to showdown, are we ignoring the fact that the cards dealt to the players played a role in their decisions? Has the random deal of the cards "controlled" the decisions of the players, thus transitively controlling the outcome of the hand? The key distinction here may be that compelling, suggesting, or guiding the players' decisions is not the same as controlling them; the players are endowed with free will and can choose to call that river bet with their nut-low missed flush draw if they want to. The random elements can guide strategic choices in a way that is occasionally forced... but it's only forced if the player wants to play well. If the player were truly controlled by the cards, there would be no strategic option available. That bad moves exist within a game is emblematic of the existence of diverse strategies within that game. For either consideration of what an outcome is in poker, despite the fact that folding and bluffing aren't necessary conditions for skill to exist in a card game, they certainly serve well as the most obvious and salient ways in which players can control outcomes. In a context where we are forced to defend poker on the basis of the winner of a hand being the outcome, with no consideration given to the fact that superior players will win bigger pots and lose smaller ones, arguments such as that of the Cigital study play an important role. It's at least a little intellectually dishonest, as it's in some sense only a coincidence that the most popular forms of real-life poker happen to involve enough folding for showdowns to occur less than half of the time, but, given the ambiguity and indeterminacy of the question of predominance, some degree of hand-waving is often necessary. 16) Does duplicate poker have higher skill relative to chance? Duplicate poker is a poker variant which attempts to reduce the impact on game outcomes of the intrinsic randomness from the shuffle of the cards. The general principle is that two poker games take place on two separate tables, with the order of the shuffled cards controlled to be the same at both tables for each hand. The payoffs to each player, rather than being the standard number of chips won or lost in that hand, are based on a function of the difference between the net chip performance between that player and his or her duplicate at the duplicated table. In this sense, some of the salient chance features are mitigated by playing duplicate poker instead of regular poker. A player dealt a good starting hand isn't automatically being given a profitable opportunity, as he must outperform a duplicate player who has also been dealt the same hand. In the sense that regular poker "is skill in the long run" once the randomness of the cards has evened out, duplicate poker attempts to speed up this timescale by keeping the hands even throughout any interval of play. It's ok that "no amount of skill can change a deuce into an ace", as this will impact both of the paired players. While duplicate poker has never gathered much popularity, its cause has been taken up by various companies over the years. The eponymous DuplicatePoker launched the first real-money online duplicate poker room several years ago, closing its doors and disappearing in 2008 without much public statement. More recently, SkillBet has launched a variant of duplicate poker in which there is only one human player at each table with the rest of the players being bots, which removes the possibility of particularly-exploitive collusion between conspiring players sitting at different seats that duplicate poker would provide. Perhaps most relevant is that the International Federation of Poker, an organization seeking to spread awareness of poker as a mind sport, has adopted a duplicate poker format for a major tournament it held last year in London. In all three of these cases, the parties involved have marketed their ideas using claims that duplicate poker "has more skill" than regular poker, or, in some cases, asserting that it "is all skill" and has no chance elements at all. There's a strong intuitive appeal here, but are these claims accurate? At this point in the essay, we quickly recognize the idea that duplicate poker has more skill than regular poker to be nonsense. Removing chance from a game is not the same as adding skill to a game. The depth of strategy in most duplicate poker games should be roughly the same as regular poker. A duplicate poker cash game with a typical payoff function on the differential between player performances would have the nice property of the correct EV-maximizing strategies being the same as they would be for a regular poker cash game, as every incremental chip won or lost contributes equally to the players' payoffs. Duplicate poker tournaments, however, will necessarily involve different considerations for any payoff function due to the nonlinearity of chip values, which will lead to different strategies than both cash game poker and traditional tournament poker. The scoring system for the IFP's London tournament and for SkillBet's tournament games, essentially rewarding only the players who get the highest scores at their tables, would induce players who are behind in the standings to take increasingly large risks as the end of the tournament period nears — and to hope their opponents were not making the same plays, which would eliminate the possibility of earning or losing any points in that hand. These strategies will not necessarily be more or less intricate in their strategic depth than the strategies for corresponding cash game, just different, perhaps in the same way that a regular poker cash game and a regular poker tournament have different strategic considerations due to nonlinear chip values. If moving to duplicate poker has any impact on the relative influence of skill and chance in poker, it would certainly be to reduce the chance in the game, but even that is not formally clear. The rules of the duplicate variant do certainly eliminate the role of chance in the random deal of the cards, but that is only one source of randomness in poker. Randomness in poker also comes from the unknown or simultaneous strategic choices of one's opponent, as discussed in part 2 of this essay. When it comes to that source of chance, not only does duplicate poker not reduce it, but it actually increases it. The outcome of a hand or game will depend not only on the traditional strategic interplay between a player and his opponents at the same table, but also on the strategies of his duplicate, and the sensitivity of the outcome to this additional source of randomness can be immense. For example, if a good player is in the fortunate position of playing a duplicate poker cash game against a very poor partner (opponent) at the duplicated table, the good player might properly fold a speculative, slightly -EV hand, but when his duplicate decides to play it, the good player will often get a large positive or negative swing depending on whether or not his duplicate hits his draw. In a situation where folding and calling might be close in expected value, regular poker would let the player choose to fold and take no further risks in the hand, but this situation in duplicate poker is precisely the situation most likely to lead the two paired players to make different choices and lead to a large payoff or loss. It is totally plausible that a player's outcomes in duplicate poker could have higher variance than that of regular poker. Even if we don't focus on the spread of a player's outcome distributions, the duplicate poker variant certainly introduces an additional source of randomness to the game while it eliminates the salient source of the shuffle of the cards. It's not clear that one outweighs the other. A similar take on duplicate poker by Nick Jones at Pokerfuse drew parallels between this fallacy of duplicate poker and the incompleteness of Sklansky's Fundamental Theorem of Poker. In the sense of my own generalizations to the Fundamental Theorem of Poker, duplicate poker could only hope to mitigate some of the randomness that lies between Level 0 and Level 3, leaving all of the strategywise uncertainty untouched (and adding the very impactful extra source of strategywise uncertainty from the duplicate player). For duplicate poker to truly have no chance elements at all, as some of its proponents have claimed, is to accept that the object of a poker game is to predict what cards will fall, that an expert poker player will have the prescience to know to properly continue with a speculative hand only when it will end up hitting its draw. In reality, poker accepts that future random events are unpredictable and instead has the objective of maximizing expected value over these future uncertain events, and there is plenty of uncertainty remaining in duplicate poker. On the whole, from any measure of the relative influence of skill and chance in games, it's not clear that duplicate poker is any further along the theoretical scale of predominance than regular poker is. While it has never become popular or had many strong endorsers, thus suggesting that it's not a particularly good variant of poker, duplicate poker is a bona fide variant of poker. The game is still poker, it's just poker under a perturbation to the payoffs and strategies that I (and presumably others) feel is an unnecessary departure from the purity of the game. The salient randomness is convincing, though. Among other implications, duplicate poker does gives each of its players much more of an "equal challenge" than regular poker. So, while I wouldn't discourage entrepreneurs and poker enthusiasts from trying to pass off duplicate poker in a region or social context which discriminates against regular poker for various informal reasons relating to salient randomness, please don't claim that duplicating out the shuffle of the cards makes the game all skill. Just focus on the honest fact that the impact on the outcomes of the random deal of the cards is mitigated and that the remaining uncertainty in the game is more obviously similar to that of other games commonly accepted as skill. 17) Why does poker need randomness? Some competitive games other than poker have randomness that would ideally be removed and could be removed without changing the strategy and appeal of the game. The toy game example of rando chess, traditional chess with a random component tacked onto the end, is probably a worse game than traditional chess for both casual and competitive play; if rando chess were the game that was invented and popularized first, it would likely be replaced by traditional chess rather quickly. Similarly, physical sports affected by factors such as wind and weather might end up being better, more engaging games in a world where these games were not influenced by these external factors and where raw individual physical prowess and game strategy were the only factors in the outcomes. Poker, however, could not practically remain the same game if the random deal of the cards were removed. Consider the number of different situations that could take place in a game of poker. This number accounts for every possible decision point for every combination of holecards, boardcards, and betting lines. Even for as simple of a game as Heads-Up Limit Holdem, this number looks to be about 290 quadrillion — I'm not going to double-check this, but the point is, it's big. Let's design a way to play Heads-Up Limit Holdem without its intrinsic random components and call it deterministic poker. Playing deterministic poker would involve each player sitting down and specifying the decisions they would make in each of these 290 quadrillion game situations. After the players (and their ancestors) finished writing out this full strategy specification, a supercomputer could compare the players' strategies against each other and decide the winner by playing through each of these situations. Alternatively, each of the 290 quadrillion game situations could be played through in sequence by the players. Neither of these are particularly efficient, but, with a long enough amount of time and infinite human longevity, the game of poker could indeed be played fully deterministically. There's certainly no intrinsic randomness in deterministic poker, and it would never be treated as gambling. Instead, in the real world, the game of poker ends up being essentially the same game as deterministic poker (with the added bonus of being realistic to play through) by having its players play through a randomly-chosen subset of these 290 quadrillion game situations for whatever period of time they find comfortable. Poker and deterministic poker are equal in expectation for the players and admit the same strategies and skills. Just as rando chess and chess have the same strategies and would eventually produce the same ranking of their players, poker and deterministic poker are, in this sense, the same game. The same is true for other strategy games with intrinsic random components, such as bridge, backgammon, Scrabble, and Magic: the Gathering. The game trees for these games are too large to play through in one sitting or in one lifetime, but, by randomly shuffling between these game situations, the depth of strategic diversity of these games can be obtained and enjoyed in a reasonable amount of time. Thus is the miracle of randomization, enabling an activity that could not exist without it, and yet most of our society fears this type of uncertainty. In poker, since the variances are always finite, risk management principles can allow a player to control and ultimately ignore the effects of the intrinsic random components of the game. From this perspective, the presence of the intrinsic random components in real poker does not make the game meaningfully different from deterministic poker. This is in stark contrast to other games which are commonly treated as gambling. One-player casino games without randomness would just be machines or tables that a customer could walk up to and, after specifying a full strategy for any potential strategic inputs, immediately be handed some smaller portion of his or her bet back. Casinos would be much less popular in this world. Poker without its intrinsic random components would still be a strategically-rich and compelling game. Games of chance without their intrinsic random components would be nothing. In addition to the practical reasons that poker needs randomness as discussed in the previous thought, many players will say that another reason that poker "needs" randomness is for various reasons of attracting people to the game. This isn't quite a need, but it's certainly a desired property, but not only for the obvious reason of allowing weak players to overrate their skills. To a skilled poker player, yes, the most blatant upside of poker having randomness is that it obfuscates the relative skill of the players. If a player were hoping to ascertain his skill ranking within a group of players solely by observing game results, a lot of volume would have to be put in before the statistics confidently revealed who the best players were. The winning players will make money over this period and, especially at the lower levels, one's opponents are also otherwise likely to misevaluate their own skills due to a long list of foibles of the human mind. Meanwhile, serious players who study game strategy away from the table are more readily able to quickly assess the skill ranking within a group of players by observing the mistakes that the players make, rather than merely waiting for the results to converge over time. The more subtle marketing advantage of poker's randomness is that it leads towards bigger prize pools, which helps attract mainstream attention, make television coverage more exciting, and creates more higher-utility interactions between serious players and casual players. The core idea here is as follows: assuming that the required expected value for a winning player were held constant, the higher the influence of chance in a game, the higher the stakes must be for the flow of money from weaker to stronger players to be of this desired size. For example, if poker had less chance, then, for any type of poker tournament, the buyin need not be as high as $10,000 or $1,000,000 to sufficiently incentivize the best players in the world to compete. If poker tournaments were usually won by the best player in the field, then the $10,000 World Series of Poker Main Event would have a seven-digit expected value and an absurdly high ROI for the world's best player. Games such as Scrabble and Magic: the Gathering, where the influence of chance over skill is usually smaller (over the timescale of, say, a weekend) are typically played with prize pools several orders of magnitude smaller than those that are common in poker, which perhaps contributes to them being less interesting for onlookers and curious would-be players. If poker had less chance in its outcomes, then the pull of the economic equilibrium would reduce the buyin size of poker tournaments until the best players' expected values were closer to what they are in the current poker market. This is a concern not only for the incentivizing of players, but also in allowing for a stable poker economy; even if all players had rational assessments of their abilities, a faster expected flow of money between weaker and stronger players would cut through the entertainment budgets of the casual players more quickly. This isn't to say that exciting, big-money poker events need to be marketed alongside gambling as they so often are. The fact that the poker which reaches the television airwaves and mainstream consciousness is so often taking place in casinos and cut together to highlight the emotions and swings of the players is, in my opinion, a significant detrimental factor in cementing the ignorant onlooker's misperceptions of poker as homogeneous with traditional gambling. Poker could be presented to the public with a more toned-down, analytical, competitive framing. The big-dollar appeal would still attract interest even if the game were not conflated with gambling. A Scrabble tournament with a million-dollar first prize would get plenty of attention. For better or for worse, people are compelled to follow games which award big prizes. All that aside, an academic approach to analyzing poker ends up largely ignoring these potentially financially-lucrative facts about poker's appeal and ability to produce consistent winnings for its best players. From the broader perspective of game design, as noted by Richard Garfield in his lecture, an important advantage of using chance in games is that it allows a wider set of players to enjoy playing the game with each other. Deterministic games such as chess are rarely fun when played between people of vastly different abilities, but poker can be entertaining to all parties involved even when their skills greatly vary. This isn't because the weaker players are necessarily interested in gambling or that they necessarily enjoy games of chance in general. It's because a game with random elements will usually be more dynamic and interesting in its gameplay than a deterministic game. Not only might the weaker player win sometimes, but, even when they lose, they won't always be losing in the same way each time they play. Even if the money were entirely taken out of poker, it would still be an excellent game for social gameplay. That any fundamentally mathematics-based game could appeal to as broad an audience as poker does today is a testament to the compelling diversity of play that its randomness generates. Poker manages to be at just about the sweet spot of balance between skill and chance, both for casual play and for competitive play, and that should not be taken for granted. Taking the chance out of poker, if it were even possible to do so, might be hurt the game. I had always imagined that one of the points I'd write about in this essay would be how no academic studies have ever concluded that poker is predominantly chance, but the recently-published paper out of Germany, Is Poker a Game of Skill or Chance? A Quasi-Experimental Study, changed that1. Neuroskeptic was the first to break the story to the poker community with a short but mostly-complete summary of the paper. Poker's own Short-Stacked Shamus at Hard-Boiled Poker wrote about his impressions from his read. In Is skill in poker – and elsewhere – just one great big bluff?, Tom Chivers of The Telegraph uses the study as a basis for extrapolating some broader ideas from behavioral economics, though I find his take on the study to be a bit shallow and tangential... and the headline to be pretty close to unforgivably sensationalist, inaccurate, and unrelated to the content. The rigged-card conditions for receiving better cards had more of an impact on winnings than the skill of the players, therefore "chance clearly dominates skill; thus, poker should be classified as gambling". While experts outperformed average players overall and were able to lose less money with worse-than-average cards, it turns out that, in the "better-than-average cards" rigging condition, average players outperformed expert players, as illustrated in the below graph. The authors take this to support the conclusion that the cards are what primarily affect outcomes and that players' strategies are much less impactful. 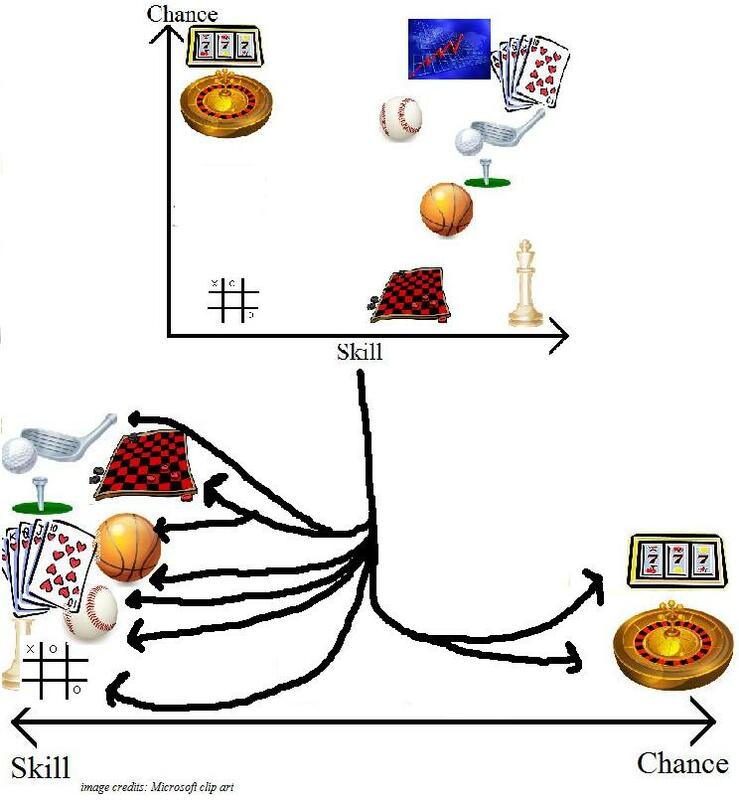 source: Neuroskeptic: Is Poker A Game of Skill or Luck? Before we delve into the flaws in these conclusions and in the methodology and assumptions that lead to them, it's worth noting that the seemingly very-small sample size of 60 hands per player is not really the problem here. Many poker players are inclined to laugh the study away at the first mention of this sample size, but the authors are actually quite self-aware and acknowledging of the shortcomings and limitations of their study. The 60-hand cutoff was likely important for practically gathering the needed data with real human volunteers. "solely or principally on chance rather than on the players' abilities... under [the conditions] which the game is typically initiated and played, which depends on the skills and experience of the average player... an individual who is generally interested in playing the game, has learned the fundamental rules and has had some practice playing." On the one hand, it could plausibly be argued that the influence of strategy and skill would be more prominent in longer poker sessions and would entail a stronger impact on the game’s outcome. On the other hand, it could be assumed that with longer play periods, the difference in players’ level of skill would decrease. This would lead to a greater contribution of chance to the outcome and a need for new, inexperienced players to reduce the effect of chance. I think this is a dubious, hand-waving argument to justify such a short time horizon. I'm not sure how I'd estimate how many hands of play in a poker game are necessary for an average or amateur player to start to closely-approximate the skill level of an expert, but I'm sure it's way, way more than a few hundred. Regardless, even if the sample size is low, I don't think that's the problem with this study. I would expect the results to be the same even with a large sample size; the issue is with the rest of the methodology and the biases it introduces. The two core findings each result from problems in the approach taken. The authors concluded that chance predominates skill in poker because being dealt into a seat rigged to get dealt the winning hand more often than usual increases one's winrate by more than the difference in winrates between strong and weak players. This suggests that the interpretation of predominance being used is one in which any game in which there is some nonzero probability of random game elements causing a player to be unable to win despite their skill is a game of predominantly chance. This is a theoretically-interesting definition of predominance, but it would classify almost all games with random elements as games predominated by chance as long as the deck (or other source of randomness) is fixed to make the probabilities extreme enough. The average player would almost surely win in a backgammon game where his rolls were much more likely to come up 6-6 and the expert’s were much more likely to come up 1-2. The average player would almost surely win in a Magic: the Gathering game (or any other card game) where the expert’s deck was rigged to deliver a very skewed, unplayable mix of card types. An average player would likely win a Scrabble game where the probabilities were altered so that his expert opponent received very few consonants. To properly take this sort of perspective on predominance, a quantitative refinement is needed. If you go far enough into the tails of the random distributions, any game of skill with random components would be concluded as a game of chance, so the real question here is what p-value of randomness is necessary for the average player to overcome the expert's skill advantage. If the average player beats the expert poker player with the aid of only 51st-percentile random in-game outcomes in his favor, then I think that would be a reasonably intuitively convincing argument as to a game being predominantly chance. However, if the rigging has to push the favor of the cards into the 99th percentile for the average player to beat an expert, that doesn’t really show anything. I expect that no expert at any game would beat a weaker player over 99% of the time. In my correspondence with the lead author, he acknowledged that this would be a challenging target for future work, but found it to be unnecessary for the scope of this study since, regardless of the p-value of the extreme randomness given in the rigging condition, each player received this rigging an equal number of times among the 60 hands. However, the degree of good fortune given in this chance-shifting condition will certainly affect the conclusion. If less-extreme randomness were given in the "better-than-average cards" condition of this study, i.e. if it were a "only-very-slightly-better-than-average cards" condition, then the skill edge of the experts would dominate. The specific nature of the rigging seems to suggest a rather extreme perturbation of the randomness in poker. Using this computer-based method of playing, the hands of individual players and the flop, turn and river cards were manipulated to produce a standardized ranking order for each hand in terms of the probabilities of winning (cf. the standardized sequence of play of "duplicate poker"). It was established in advance that the cards of the opening hands, and the associated distribution of chances of winning, were reflected in the river in the same order for the first three places. In contrast, places were allowed to vary with respect to the flop and turn. So the rigging is done in a way which controls whether or not the player's hand goes on to be the best hand among all six players by the time the river is dealt, and this is further controlled so that the best preflop hands end up being the best river hands, even though the flops or turns could be unfavorable. This means that the typical amateur mistake of continuing with what was once a strong starting hand after a bad flop or turn will go on to be rewarded. For example, an expert may prudently fold 7♦7♣ on a Q♣K♥2♥ flop, or A♦K♦ on a Q♣J♣6♦9♣ turn. These may be correct moves in poker, but are pretty terrible moves in rigged poker where the game has controlled for the fact that you're going to spike your card on the river or that none of your opponents will make their draws. Meanwhile, the average players will incorrectly chase their draws and be rewarded on the river much more often than regular poker probabilities would dictate. This effect should be exacerbated in Limit Holdem, where the stronger players will find the right folds on flops and turns with overcards despite high pot odds. It is unclear whether the described advantage of average players with good cards under "fixed limit" conditions, due to their less purposeful [meaning continuing too often with weaker hands] style of play, is an artifact of the applied design or a phenomenon that can also be detected in the reality of poker play. I expect that this effect and the bias it introduces is indeed highly significant, enough so to fully explain the outperformance of average players in the "better-than-average cards" condition. The only way I can see around introducing some sort of bias is to not rig the deck at all, which would dictate an approach that doesn't gather its own data and instead uses a large real-world database of hands provided by a commercial internet poker site, as some other studies have done. 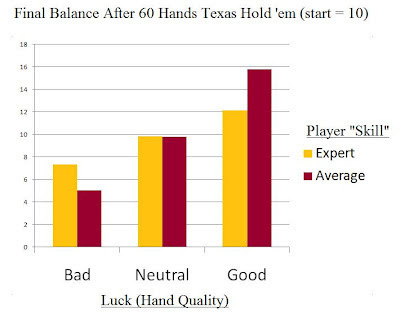 These real hands could be filtered to find which hands involved "good hands" by whatever metric was desirable, and this would prevent manipulated probabilities from favoring one player type over another. The question of what metric to use would still be difficult. The author defended this part of the methodology, again believing that it was fair because both expert and average players had the same conditions. The fundamental issue here, though, is that changing the probabilities of the random elements in poker changes the game to something other than poker. The subjects were essentially lied to (not maliciously) in that they were not playing the game they thought they were. The strategies for rigged poker are different than the strategies for poker, and if the subjects had known about the methodology and when they were in the rigged conditions, then the expert poker players probably would have properly picked up on the strategic adjustments and continued to outperform the weaker players. Also, I expect that expert poker players would be more willing to trust that an ostensibly normal poker game in an experimental setting is being run fairly. In contrast, weaker players may be guided by instincts to "play a rush" or to otherwise irrationally manipulate their assessment of what are supposed to be independent probabilities, which could benefit them in this rigged poker game. Regardless, that the subjects are misled as to the probabilities of the game outcomes means that the impact of proper strategy will be obfuscated, as the skilled players are trying to apply skills from a different game. Overall, the authors approach the task of measuring predominance in poker from a reasonably sophisticated scientific perspective with no evidence of anything but an earnest effort. If one was tasked with attempting to produce a formal, science-based argument that poker is predominantly chance, these authors have done so fairly well. Perhaps a lack of practical poker experience led them to overlook or underestimate the impact of these methodological biases on the results. I don't think they deserve the ire of our community, but I also don't think there is any meaningful validity to their conclusions. While I don't believe that this was the motivation of the study, it would be wrong to omit the observation that German poker players owe personal income tax on their poker winnings only if poker is considered to be a game of skill, but owe nothing if poker is considered to be gambling. This sort of tax rule could certainly shape a cultural and social willingness among poker players in Germany to want to keep poker treated as gambling — an amusing (or depressing) contrast with the interests of players in the U.S. to have poker seen as a game of skill. Still, a study in an academic journal has global impact. Even if German poker players would be better off if poker were treated as predominantly chance and gambling, this is not the case in most of the rest of the world, and it's also a classification that I feel to be intellectually dishonest and fundamentally wrong. To bring our long journey to a close, it is worthwhile to condense the wide array of different perspectives we've treated on predominance of skill and chance into one central list. If predominance is a question with no perfect answer, which answer is the best one? Emotional Approaches — These are common intuitively-appealing arguments which consider neither the way the game is played nor the fundamental structure of the game. The only role such arguments might play is in quickly illustrating a rough idea to an audience which is not interested in understanding any deeper details of the game in question. 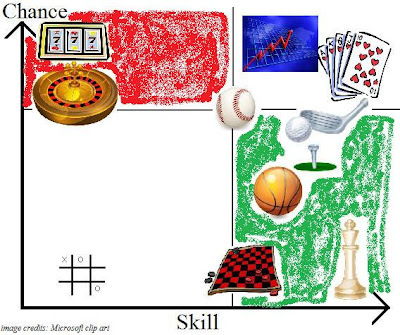 Outcome-Based Approaches — A type of approach frequently discussed throughout this essay, these attempt to measure predominance between skill and chance solely by looking from different angles at real-world game outcomes. These approaches usually either don't dig into the nuances of the fundamental structure of the game or ignore them completely. Keep in mind that all outcome-based approaches fail on populations of similarly-skilled players and depend on duration of play and thus have significant consistency problems than would be acceptable from an approach of pure logic. These arguments can be quite illustrative and convincing, moreso than purely emotional approaches, but that they may happen to apply to various real-world forms of poker is a coincidence. Therefore, we should be uncomfortable with making these our primary arguments, but they can be solid supplemental arguments. Fundamental Approaches — These are based entirely on the fundamental structure of the game and thus will be consistent over time and over different player populations. Ideally, this is the only type of approach on which long-term legal classifications would be based. Games with historical or social associations to gambling are games of chance. Almost everyone you've ever met n/a This has no bearing on a scientific discussion, but is a deeply-entrenched perspective in most of society which underlies the default framing of poker in this discussion. 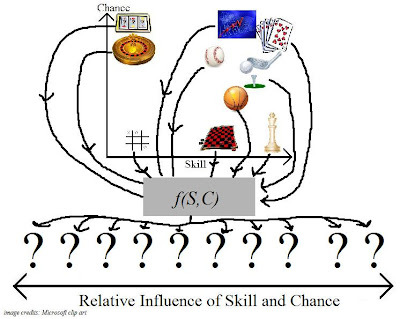 Depth of skill in a game is not necessarily related to the number of personal characteristics that inform proper strategy, and chance is not related at all. This is an improper logical conclusion; the existence of positive-expectation players implies skill, but not the converse. Highly sensitive to the chosen population of players, thus inconsistent; faces definitional issues of "control". Games whose outcomes resolve themselves using the random elements less than half of the time are games of skill. Cigital 14 Not inherently related to depth of skill in a game. In poker, ignores size of wins and losses, which are crucial elements to real outcomes. Games for which positive-expectation players exist in some population are games of skill. Levitt & Miles, Fiedler and Rock (CRF) 3 Can identify when a game is high-skill, but cannot distinguish between low-skill games and games where all of the observed players are equally skilled, so it only works sometimes. Poker's overt randomness is not necessarily greater than that of other gamess. Non-overt randomness is a significant source of randomness in most games. Obviously unrelated to chance and only slightly related to skill; that this is true for most non-poker games in our world is purely coincidence. Any game which does not always offer its players equal challenges is a game of chance. Pennsylvania V Dent, proponents of duplicate poker 13, 16 Not related to depth of skill in a game. Strategic and complexity-based uncertainty exist even in games with even challenges. Very few games truly do offer equal challenges, even among games commonly accepted as skill. Non-robust for game modifications where guaranteed-loss options are added, unless we consider avoiding that option a meaningful exercise of skill. Games can have arbitrarily large or small skill or chance components while still adhering to a tournament-based structure. One-player games offered openly by companies must not be games of skill, otherwise skilled players would bankrupt the company. McCrory, not Judge Weinstein 11 This is an intuitive way of separating orthogames from house games, which is important. Any closed, symmetric, strategy game is a game of skill. Me 20 A refinement of the above, this is the best practical solution to a logically-incomplete problem. Any closed, multiplayer game with any amount of skill should be classified as a game of skill. There's simply no other well-defined way to handle games of mixed skill and chance. There can't be anything in the middle of the axis of relative influence of skill and chance without arbitrarily locking in a specific game duration and ignoring the possibility of legally redefining games to be longer matches. Furthermore, as we've seen, the approaches that do implicitly specify a game duration find themselves relying on further assumptions about the type of player to measure, the specific skill/chance metric to use, and what it means to "control" an outcome. There's simply no clear alternative. The only consistent solution is to push every game in the middle to one end or the other. It is clear that skill is, historically and practically, the more important property. The approach that I recommend is a simple, clean, readily-applicable cut across the set of all games. In particular, it classifies all conceivable games within the broad family of "poker" the same way, which very few other approaches do. Moreover, I believe this is consistent with the social intentions of treating games of chance and games of skill separately in the first place. Games of chance offer no personal or social benefits other than the pure entertainment value for participants who choose to play them. This shouldn't be ignored, but games of strategy offer that and much more. Strategy games ("mind sports") are the mental analog of physical sports and thus are valuable to society for the same reasons that physical sports are, perhaps moreso in an era where more and more careers demand mental acuity rather than physical prowess. Strategy games with random components teach valuable and broadly-applicable lessons to a human brain which is very poorly-equipped to handle randomness without training. Economic concerns about wealth changing hands and desire to regulate activities which might attract problem gamblers are a bit of a red herring as they might relate to predominance, as these can certainly both take place within games of skill. (While this is outside the scope of this essay, nothing I say here should be taken as ignoring the existence of problem gamblers in poker.) It is clear to me that casino games, lotteries, and markets deserve different regulation and treatment than that of strategy games. One possible practical tweak would be to limit this approach to games with nontrivial strategic depth, i.e. no betting on a tic-tac-toe where ties are resolved with a coinflip. This could be handled by a case-by-case observation of the strategy differentials between players of a game as it is commonly played. This leaves the question of how much of a strategy differential would be needed, but that's an easier question than predominance in general. In practice, any game with real-world players who don't all adopt the same strategy should be suitable. As a final mathematical note, in the formal structure of applying a metric upon skill and chance simultaneously as we discussed earlier, classifying all games with any amount of skill as games of skill is analogous to a lexicographic ordering over the dual inputs of skill and chance. To map games into the axis of relative influence of skill and chance, the lexicographic ordering first sorts all games according to their degree of skill and only sorts by the degree of chance to break exact ties in skill, much as how words are ordered in a dictionary by first sorting by the first letter of the word and only using the second letter to sort among words with common first letters. For example, chess and rando chess are an exact tie in skill, but rando chess has more chance, so chess would be sorted to have a higher relative influence of skill over chance than rando chess. More practically, a poker cash game where players could run it twice (or infinite times) would have a higher relative influence of skill over chance than a cash game without this option. The most important idea to keep in mind when handling any aspect of skill vs. chance or gambling vs. not gambling in poker is that poker is very similar to most other strategy games with random elements such as bridge, Magic: the Gathering, and Scrabble. No logical approach to predominance could classify poker as predominantly chance in a way that doesn't also necessarily classify some other strategy games or variants thereof as predominantly chance. There is nothing fundamental to poker that isn't also fundamental to other competitive strategy games. Poker is unique in its popularity, the stakes for which it is currently played, and its marketing as and historical treatment as gambling, but is not unique in any structural way. Really, in light of this, it's not fair that the onus is on the poker community to prove that poker is a game of skill. The onus should instead be on those who wish to classify poker as a game of chance and, as we've seen here, it's much more straightforward to find issues in those approaches than it is to blindly stab in the dark with a dozen different and imperfect intuitive arguments as to why poker is a game of skill. In many ways, the entire suggestion of there being a "debate" over skill and chance in poker is a bit of a farce. One final issue that I have with the undefined notion of predominance is that there is no record or case history (that I'm aware of) of the test ever being actually quantitatively applied to any game. We are living in an era where games in general are proliferating and overlapping new and different parts of our lives. Don't game designers deserve clear guidance as to what they can and can't do with chance in their games without falling into classifications as gambling? Again, it is worth acknowledging that I have no expertise in law and have significantly simplified the legal definitions of predominance, which vary from state-to-state and across countries. I also have been generous in my assumption that mathematics has any direct bearing on interpreting law, as much of this depends on politics and intuition over logic. It'd be great if we could get a more formal, consistent definition of the legal statutes of predominance, but, in the real world, the PPA is doing a great job of managing these different arguments in making real progress for our game, despite the lack of complete logical consistency of most of these arguments. Nothing I have said here should be seen as undermining the excellent efforts of these parties. Thanks for reading. I'd be happy to expand upon any of these ideas for any effort which aims to improve public awareness and understanding of poker or for anything which could contribute to legal arguments. Really, though, I'd love to continue the discussion with anyone at all, so if you're interested in talking with me about any aspect of this essay, please contact me! Best Hand Wins: How Poker is Governed by Chance by Vincent Berthet — This study references the Cigital study but takes the further step of considering that the cards dealt to players affect their actions, and hence that a hand that does not end in showdown is not necessarily a hand where chance played no role at all. This study finds that 72.8% of hands which end in no showdown were nonetheless won by the player who held the best hand at the point when the hand ended. This study comes off as fairly informed and aware of poker and is worth a quick read. It's a reasonable different perspective than the Cigital study of what it means for cards to "control" an outcome, but the logical misstep in concluding that this means that poker is predominantly chance comes from assuming that the threshold of predominance occurs halfway between 1 and 1/N, where 1 is the probability of the best cards winning if poker were determined entirely by the deal of the cards and where 1/N is the probability of the best cards winning if poker were determined entirely by skill (i.e. if the cards don't matter at all). There is no quantitative basis for assuming that the threshold would be at the midpoint, especially when player actions and strategies do directly impact this statistic. One could easily design different games which have varied levels of this best-hand-winning rate statistic which have high skill, low skill, high chance, or low chance. Since this approach admittedly focuses on winners of pots rather than winners of money and thus ignores betting, all of my observations of the shortcomings of showdown-based studies would apply here. The work of Ingo Fiedler — The work by Fiedler and Rock is commonly used as support of the predominance of skill in poker, as their statistically-minded critical repetition frequency shows that, by their measure, skill overtakes chance in poker after about 1,000 hands. Meyer and this German study, however, note that a 2011 paper by Fiedler, unrelated to the topic of skill and chance in poker, finds that the median online poker account in a large database played less than 1 hour/month of poker, causing these players to not quite reach the CRF threshold within a year. Considering the median online poker account is pretty close to considering the median human who has ever played poker even once and will almost certainly include far too many former or very infrequent players. Again, this might be a reasonable interpretation of these particular German statutes, but I think it's unrealistic for other uses.